In this well-crafted family drama, that huge Julia Roberts smile turns up, but it’s haunting. The film, a tribute to maternal love, it is likely to sadden you to your core. Rating: 3 stars out of 4. A holiday movie that’s well-crafted but likely to sadden you to your core, Peter Hedges’ “Ben Is Back” takes place on Christmas Eve in an upstate New York town. Nineteen-year-old Ben Burns (Lucas Hedges, of “Manchester by the Sea”) has returned home unexpectedly. His mother Holly (Julia Roberts) is thrilled to see him, but his teenage sister Ivy (Kathryn Newton) and stepfather Neal (Courtney B. Vance) are more wary. Gradually, we learn why: Ben is an addict, early in his recovery, and the scars he has caused his family are still fresh. Holly decides that he can stay, but only if she closely monitors him every minute — an arrangement held together by the fragile tape of her belief that this time, somehow, things will be different. The next 24 hours are harrowing, both for the family and the audience, as we piece together the events that led Ben to rehab, and the way they still reverberate for him back home. The director, who’s traveled down the dysfunctional-family-over-24-hours road before (his 2003 debut, “Pieces of April,” also involved a prodigal child), sometimes lets things get a bit beyond belief in the film’s second act. But he elicits honest, painful performances from all his actors; you see Ivy’s guilty resentment; Neal’s protective shield; Ben’s desperate holding on to home like an anchor in a storm, even as it slips away. And, most of all, you see Roberts, who takes hold of this movie like a lamppost in the winter darkness. That huge Julia Roberts smile turns up here, but it’s haunting: Holly is trying to make Ben’s jokes funnier than they are, to reassure, to will her family into holiday-appropriate happiness. But behind it is a quiet, crushing sadness; a sense that something inside this woman died long ago and won’t come back. “Call your mother,” she blurts out quickly, to a shadowy associate of Ben’s that they encounter during a very long, dark night. It’s a performance — and a movie — that’s a tribute to maternal love. 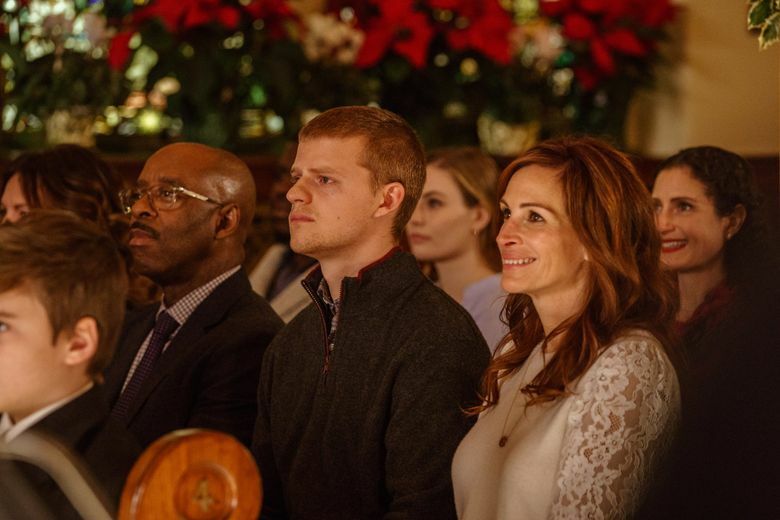 ★★★ “Ben Is Back,” with Julia Roberts, Lucas Hedges, Courtney B. Vance, Kathryn Newton. Written and directed by Peter Hedges. 103 minutes. Rated R for language through and some drug use. Opens Dec. 21 at Pacific Place.